In Japan in 1996 a craze started; by the turn of the century, it had worked its way around the world capturing the hearts and minds of gamers as easily as a level 3 Rattata is caught in a Master Ball. That craze was Pokémon: Nintendo’s pocket monster catching/training/battling powerhouse. The two Game Boy originals Pokémon Red and Blue set the world alight with tight RPG gameplay that made people both young and old want to be the very best, like no one ever was. Since the early days of the franchise Nintendo has fanned the fires of fandom with hundreds of pieces of Pokémerchandise but only a few core games. By the time Pokémon Emerald came out on the Game Boy Advance the world had been saturated with pocket monsters for nearly ten years. To those who grew up on Red and Blue the series seemed tired, making up for a lack of innovation in core design by adding in more and more collectible creatures. 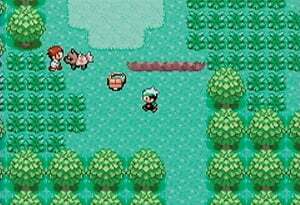 Unfortunately Emerald was not the game to turn it all around; instead as an amalgamated companion to Pokémon Ruby and Sapphire it was more of a stopgap between two generations of RPG’s. It trod much of the same ground as its GBA brethren, squished the two stories together and rejigged some of the structuring, but was essentially the same. Your enjoyment of Pokémon Emerald will depend entirely upon your relationship with the series as a whole. Absolute Pokémaniacs will love hunting down all the new critters in the time-honoured tradition albeit with slightly improved graphics, but for first-time trainers Emerald makes for the perfect introduction to the ins and outs of the franchise. To those gamers who fall somewhere between the two, especially those who’ve dabbled in Pokémon before, Emerald makes for a less exciting prospect, because at times the game can just feel too familiar. Everything is instantly recognisable: the art style, the four direction movement, the music; they all evoke fond memories of the series’ older entries in an updated form. Some elements aren't updated, such as the 8-bit-quality battle cries of the first generation Pokémon that could have been lifted straight out of Red and Blue. And yes, they still sound like a computer drowning. The problem is that Emerald vehemently sticks to the Pokémon formula even when it was fast becoming outdated. That’s not to say that the formula isn’t a good one, it’s just in need of sprucing up. For those of you that have been living under a Geodude since 1996 this is how a Pokémon game goes down: starting off in a small town your character is given a Pokémon and promptly sets out on an epic adventure to fight and capture monsters in Pokéballs, then train them and battle to the Pokémon league by defeating the region's 8 Gym Leaders. The player is also tasked with cataloguing the critters they meet in the Pokédex: a handheld encyclopaedia of sorts. Extra geek points go to players who manage to ‘Catch ‘Em All’, although with nearly 400 of the little buggers to get it’s not as easy as it used to be. 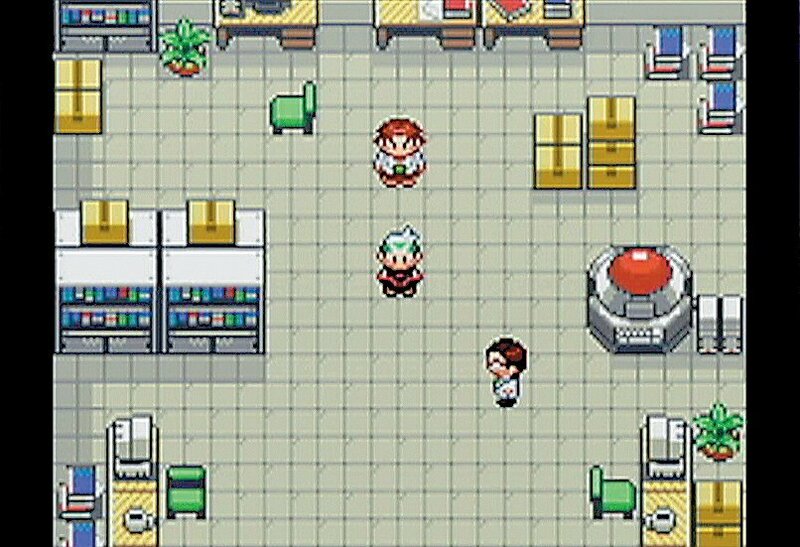 So Pokémon was in ’96, so it is in Emerald and so it has gone on to be in later games. This makes Emerald instantly accessible to anyone who has ever played a Pokémon game before, but it also means it is in danger of retreading much of the same ground, and this is only exacerbated through sharing the Hoenn region and much of its story with Ruby and Sapphire. It’s the story and its similarities to those of the past that most gamers will take issue with. How many times can a young boy or girl leave home to wander around filling a Pokédex, becoming a master trainer just because a local Professor asked them to, and their parents are absolutely fine with that? Indeed the story in Emerald has about as much driving force behind it as a bike without pedals – you literally go because you are asked to. 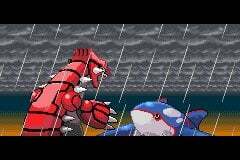 Along the way you get caught up in the dirty doings of the eco-conscious yet slightly sinister Teams Aqua and Magma who are trying to awaken warring legendary Pokémon Groudon and Kyogre for their own mischievous ends. The misguided Team Magma hope to expand the land to build more homes for people to live in and the Aquas want to expand the sea… because they want everyone to live in boats? On the whole the plot’s a bit ropey and just serves as an excuse to throw you into ever-increasing volumes of battles. Despite the story grumbles the basic mechanics are as solid as ever. The battles make for some completely engrossing gameplay: simple enough that a five year old can grasp them, but type weaknesses, the Pokémon-specific abilities and two-on-two battles add a tactical depth that can take an age to master. The same goes for catching and breeding; gamers will find it easy to assemble a relatively strong team of six that’ll see them through to the Elite Four, but experts can spend a long time tweaking stats and moves to bring up a monster just right – some may even go so far as to enter their favourites into the beauty contests for extra kudos. All this depth added to a lengthy main quest that can easily take 30+ hours to complete means that Emerald is a big investment, especially for those who have already completed Ruby and Sapphire. 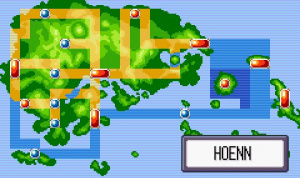 The major difference between Emerald and its direct predecessors is the inclusion of the Battle Frontier: a competition area on an island far out to sea that you can only travel to after having beaten the Elite Four. 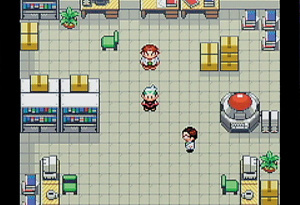 This area acts as a place to show off your team and engage in a variety of battles that put an interesting twist on the standard formula, including battles where you rent Pokémon from a limited selection or where you leave your team to fight it out on their own, relying solely on their nature and move preferences to get them through. Conquering each challenging building will earn you further badges to add to your collection, as well as battle points to spend on teaching your Pokémon new moves and buying items. One problem Pokémon games have always had is giving you something to battle after defeating the Elite Four, and the Battle Frontier alleviates some of the aimlessness of post-championship Pokémon. However the fact that you don’t gain experience for battles completed at the Frontier means that if you want to take on some of its tougher challenges and eventually reach level 100 you’re going to have to spend some time in the grass, grinding your way up. Random battles are still the order of the day and although they're not to everyone's taste, this slightly archaic J-RPG mechanic always seemed to fit Pokémon quite well. 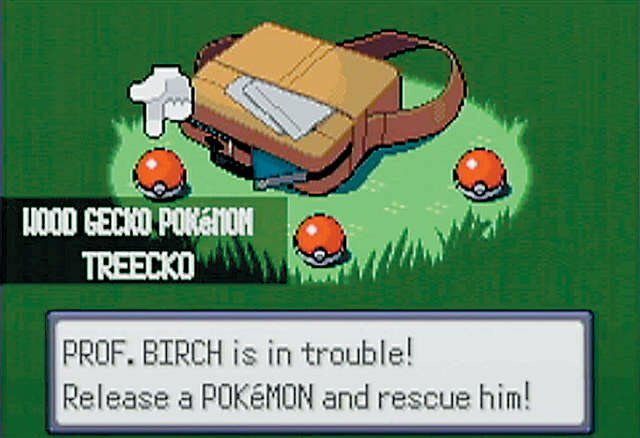 The feeling of discovery when searching out creatures to catch always made the staple screen flash and music sting that signals a random encounter an exciting prospect – but by the time you’ve slogged your way through Victory Road and its two-step random battles you’ll start to think that maybe the mechanic has had its day. Surely if 99% of the fights are against Zubats then surely that removes some of the ‘randomness’ from the random battle, so why not just go the whole hog and remove them altogether? Players who gripe at the archaic battling probably won’t enjoy the return of HMs. The ‘Hidden Machines’ that have been a standard part of the series since Red and Blue have become somewhat of an annoyance in recent years. Most of these supposedly ‘useful’ moves are used in one specific area and then are never used again; this is annoying when you consider that each Pokémon only has four available move slots, meaning that you’ll either have a valuable team member learn a relatively useless move sacrificing a space for better moves or take up a valuable slot on your squad with a low-level HM-laden Pokémon. To prove that this isn’t a gross over reaction let’s put it into perspective; there are three different Water-based HM’s needed to progress through to the end, meaning that players who pick Mudkip, the Water starter, could end up with only one space in which to choose one of the ten or so moves that Mudkip learns as it levels up and evolves. Yes the HMs are there to rein in the player’s exploration and create a more natural progression system, but they also seriously limit move sets and the type choices within a squad, meaning that players who want a competitive team will need to train another set of monsters at the same time, or at the end – and as we’ve already established experience is quite hard to come by after beating the Elite Four. Reviewing a game like Pokémon Emerald retrospectively opens up a whole can of Wurmples. Time has a tendency to show things in a different light and unlike time, the Pokémon franchise has almost been standing still, trapped somewhere in 1996 constantly reliving its glory days. This is both good and bad news, as the games are always well made, solid good fun and ever so slightly addictive, but it also means that the mechanics haven’t moved with the times and feel archaic by modern standards. Emerald bears the brunt of this backlash, being just too similar to Ruby and Sapphire to feel like a must-have entry in the series. Although it may not be the jewel in the franchise's crown, Emerald still has some sparkle, while the series as a whole could do with a thorough polish to make it gleam again. this game is sooo much better than ruby or saphire, but i wouldn't buy it if i already had ruby/saphire. battle frontier plus extra ledgendarys make it a better game. "Some things, it seems, never change"
That tagline works for most pokemon game, they're always the same thing. OFF: Can't wait to put hands on a 3D Pokemon! This is the same score Id give it... too bad these were the worst RPG Pokemon games, well to me, but I do have the sudden craving to replay one of these 3. I never even beat Emerald, I was so bored with that gen. Well, actually, I did beat it. I don't remember when, but I know I did it. But only beat it once. This was one of my favorite Pokemon games. I'll fight you for this, Laurie Blake. For the soul of Pokemon Emerald. At least this Gen brought EV training. My favorite Pokemon game is Sapphire, but White looks great enough to change that. @zezhyrule 8: Effort Values always existed. Never said they didn't, I said this was the generation that brought what is now normal EV training. Not Stat Exp whatever. I played this version until I had over 250 hours put in it. I like it better than the all-new Black/White games which are even less original. The only Pokémon games that really added something that was a substantial improvement, and not just some battle mechanics that only long-time series fans will notice, were Gold/Silver. This is pretty much how I feel about the series nowadays and why even with a touch of paint, I probably won't get B/W. I never played any of The 3rd Gen Pokemon. I still had pokemon Gold at the Time, so, I didn't care for getting new Pokemon game. That seems a fair score for Emerald. I enjoyed the heck out of it, but I hadn't played Ruby or Sapphire at the time. It's better than Diamond & Pearl (way too sluggish), but not as good as FireRed/LeafGreen or any of the other three Gen IV games. Omg, I have Pokemon Emerald. This makes me wanna go play it right now. "Sluggish" is the definition of surfing in Hoenn. 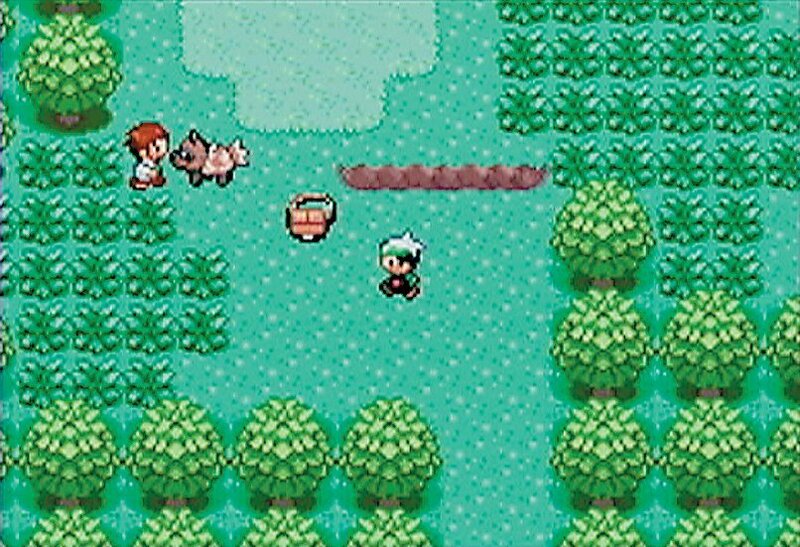 Pokemon Emerald is my favorite pokemon game! I have put in over 600 hours on it..
You could say the same about all fps's, the only differences between them are 1. small tweeks (e.g. dash, jump, slightly different weapons, etc...) and 2. story. I like this game it's more fun when you find out how to copy pokemon in it. Favorite game out of the 3rd gen Pokemon games. @BlueC: 600 HOURS! O_o And I thought my 210 hours on Soul Silver was impressive! @12 You're very mistaken. Thankfully, Black/White are mixing up the formula somewhat more than usual. 30 hours?! You must be joking. It took me about 130 just to beat the Pokémon League. By the way, only an idiot would teach 3 HMs to their starter. You're not meant to just use the same 6 Pokémon all the time. Also, despite how annoying they can be sometimes, random battles have to stay, as it would be too easy to find the critters you don't already own if you can just see them on the routes. Perhaps they could lower the probability, though. And if you want more experience after the Pokémon League, then you can rebattle the Pokémon League as many times as you want, rebattle the gym leaders (who are now much tougher than before), and even have the ultimate battle with the Ruby/Sapphire champion, Steven. I surprisingly beat this game in 11 hours (With level 100 pokemon and Latias) without noticing. That is only possible (if possible at all) with very few Pokémon, which is not how it's meant to be played. The slogan is "Gotta catch 'em all" for a reason. Did you actually play the Japanese version of Black/White? I've personally found there was very little in it that seemed new or didn't exist in some form in older games. The Dream World is a really cool idea, though. I possess Pokémon Emerald (Pokémon Emeraude in France). I'm a great Pokémon fan, but Manaphy will always stay my favourite. What Emerald did wrong in comparison to Ruby and Sapphire: putting in that terrible, awful, obnoxious phone feature from GSC. Whoever first came up with it for 2nd gen should have been fired and whoever thought it was a good idea to bring it back again should also be fired. 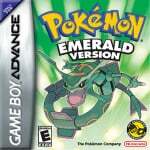 What emerald did right in comparison to its older brothers: everything else. "the games are always well made, solid good fun"
I object! Gold, Silver, and Crystal were utter Taruos feces. Those games were so bad that I gave up on the entire series as a kid. In fact, if it wasn't for me wanting something long to play on some school field trip later on in life and going "Hey, Pokémon Sapphire, those games were always pretty long so what the hell" I still probably wouldn't be playing the series to this day after the awful taste the 2nd gen left in my mouth. GameFreak shouldn't have remade those things (remakes were just as bad as the originals, actually worse since they ignored the only good thing about the 2nd gen titles and brought back the stupid Safari Zone), they should have retconned them so hard a temporal wave went back in time and erased them from ever existing in the first place. Heh, heh, heh. I couldn't have said it better myself. You have earned the Red Badge of Pokemon. You probably bought a fake "made using RPGM" version of Gold/Silver/Crystal. wow, i'm glade you don't make videogames. Emerald was my first pokemon game, think it deserved at least an 8/10. @34 Wow, someone who actually does worship Gen. 2? I am shocked. I loved the games but they are a tad over rated in my opinion. Gen. 3 is, and always will be, my favorite generation. 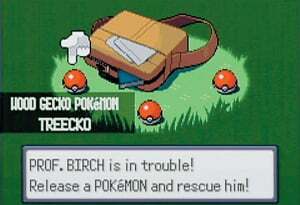 FireRed was my first game and Ruby followed close after. They are the best Pokemon games. Maybe I am biased because of nostalgia though... Oh well.